The huge, off-white head on this has the consistency of egg whites. The lumpy head leaves sticky patches of lacing as it lowers. The beer has kind of a pale honey or straw colour to it, and is clear. The smell is nice, especially for a lager - puffed wheat, honey, oats, and some kind of straw/hay/grass combo. There is honey in the taste as well as some straw. It tastes surprisingly... "golden". The water with its trademark mineral character takes, unexpectedly, a bit more of a backseat in this somewhat naked style... it's not as prominent as in their other beers, flavour-wise, but it still plays a good role and comes out more as it warms. As it warms, there also may have been some hints of fruit/citrus notes coming out. The body is rather smooth and heavy for a lager... almost medium in feel. The carbonation is just a light tingle. The finish is actually a little sticky more than anything else... there is some dryness on the tongue, but stickiness comes through more. 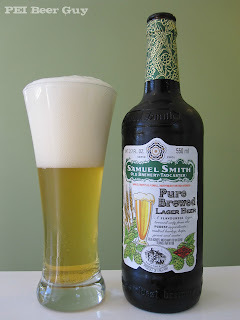 This is one of the best lagers I've ever had - it was "full", so to speak, with good flavour, and no off-flavours common for the style. Loved it.